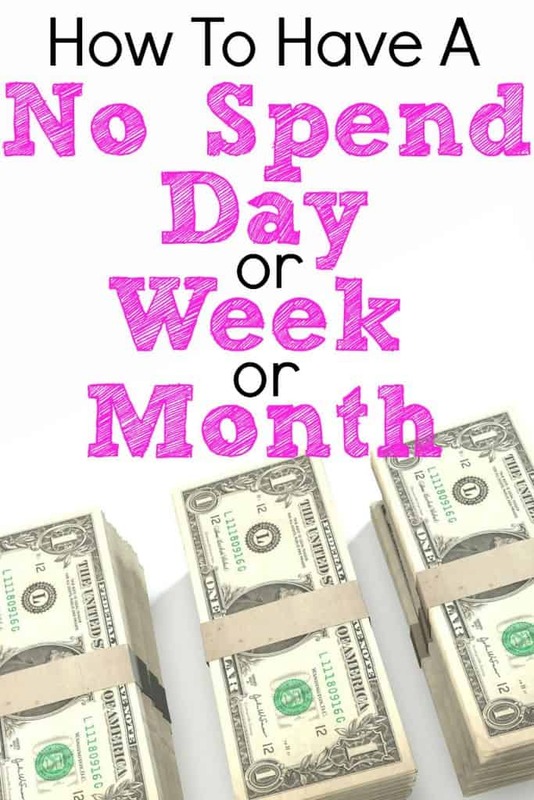 Have you ever had a no spend day or week? Ever told yourself that you wouldn’t touch those credit cards? 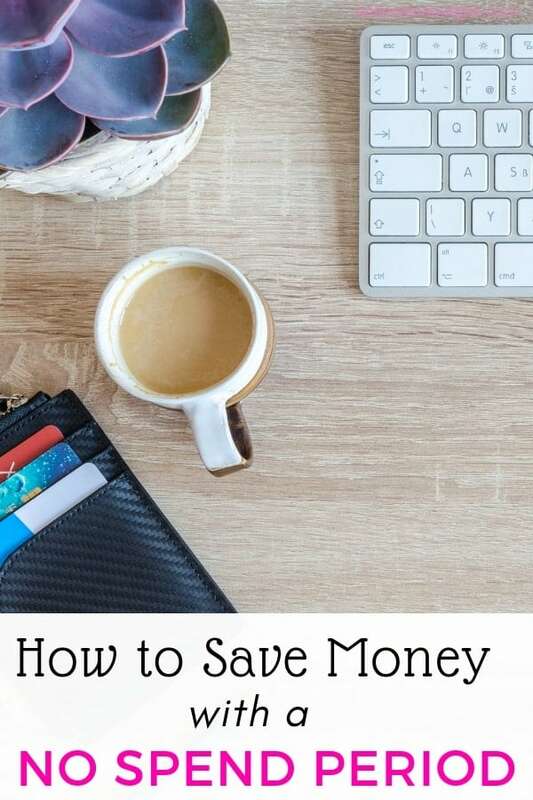 If you haven't and you’ve been struggling to save money and manage your spending, you should consider freezing your spending for a few days to reset your finances and generate some savings . Incorporating a spending freeze into your schedule can be quite healthy for your finances especially when you feel overwhelmed with it all. One way to do this is by adding a no spend day or week into your monthly budget. These tips will help you get prepared and maximize the best results! Please note, this post was updated on January 2nd, 2019. First, if you are a blogger, grab this free guide on 7 Ways to Boost Your Blog Income Overnight to increase your income this year! Next, I recommend signing up for a free live video training about how you can start your blog ASAP and make money from blogging. In order for your no spend period to be successful, you must be prepared. A no spend period might actually include some spending on necessary items, such as gas or groceries. The key is to eliminate any extra spending during this time frame. While this might sound silly, downgrade to a smaller wallet like this one. It's amazing how many cards you don't really need to keep in your wallet or use. This also helps cut down on temptation to use a credit card if you struggle with credit card debt. If you are a beginner, I would start with a small goal. This leads to more success! This could include a no spend day or weekend or my personal favorite, a no spend work week. I find it easiest for myself to save money during the work week. I always pack my lunch and enjoy the coffee my work provides. On my lunch break, I try to get out of the office and get some walking in when the weather is nice. Otherwise, I'm tempted to get on my cell phone and online shop. After work, instead of stopping at the grocery store to grab a couple things, I'll head home instead and eat the groceries I already have. It can be easy and tempting to swing by the grocery store every day after work, but the expenses add up fast. Instead, try to grocery shop once a week. If you are really looking to jumpstart your savings or pay off debt, you can really ramp up your spending freeze and challenge yourself to a no spend week or even a no spend month. This is a great idea if you overspent the previous month and you are looking to get your finances back to normal. If you’re able to carve out time to go on a spending freeze and are fully committed, that’s great! One of the hardest parts during the no spend challenge can be figuring out how to use what you have. This is where a bit of creativity can really pay off! if you like blogging and want a fun, creative outlet, read this blog post. download Amazon's Kindle book to access the library's free ebooks! learn how to travel for cheap – or even do a volunteer trip where you get free lodging and food in exchange for volunteering! Tip: If you like to travel, try staying at an AirBnB instead of a hotel. This a fun and creative way to save money. Over the past couple of years, I have stayed at a handful of AirBnB's and saved a ton of money. I've been able to rent an entire house, condo and apartment instead of a room at a hotel. I even stayed in a tiny home to see what it would be like to live a more minimal life. If you want to stay at an AirBnb, here's a coupon for $40 off your first stay anywhere! A no spend day or week or month can really help evaluate what you want or need. It is so easy to mindlessly spend money on coffee every day or overspend at the grocery store. By saying no to everything for a set period of time, you can really get an eye opening experience on your spending. This is a great time to figure out where you really value spending money. On the other hand, you also learn what you are wasting money on without even realizing it. All those little expenses can add up daily. Plus, you learn how to work with what you have. I can't preach this enough! Instead of spending money all the time as a solution, you may find that you can fix something so you can use it again. This can be tricky if you aren't handy, but I bet if you get on YouTube, there is probably a video tutorial for help! This is an important period. You don't want to fall back into any bad spending habits or go on a shopping binge to make up for several days without spending anything. This is a good time to look at how much money you saved during your no spend period as well. What do you plan to do with your savings? Are you going to transfer it to your savings account or use the extra money to pay off some bills? Will you put it toward debt? After you decide what you’re going to do, take action immediately. Put the money to use right away, or you might be tempted to use it for the wrong thing. I also recommend getting a notebook and tracking your savings. If you aren't into notebooks, create a simple spreadsheet online. This is a great way to document your spending and savings, and it's fun to look at your progress! Whether you want to start an emergency fund or a vacation fund, you have to start setting some money aside. If you’re like most people and struggle with saving, you should consider using an app like Digit. I’ve just started using this app and love it. Digit lets you save money each week from your checking account. What I really like about Digit is that it analyzes my bank account and determines how much I can really save per week. Some weeks it might be $5 and other times it might be $10. You don’t have to worry about overdraft and can contribute less or more if you need to. Can’t do a no spend week right now? No problem. When holidays, birthdays and travel are coming up, it can be difficult to do a spending freeze and you don’t want to set yourself up for failure. If you need to spend money in certain areas of your budget, you can still reduce your costs and perhaps earn a little money back as well. One of the best ways to make any money from shopping is using Ebates. Ebates pays you a percentage back when you make a purchase online. While I have to do some online shopping, I always use Ebates first because they pay cashback on purchases from hundreds of retailers. Plus, they help you hunt down coupons that you can use to reduce the price of your order. Each quarter, they deposit all of your cash back earnings into your PayPal account. Yippee for free money! This cell phone app helps you make money off your grocery receipts. Yup, for real! If you do coupon – you can STILL use Ibotta and get a rebate. For the diehard couponers out there, this will often result in getting an item for FREE. When you sign up, you will receive a $10 cash bonus when you make your first scan! If you are going to shop, you might as well make money doing it. If having a no spend period seems tough or if you don’t want to do it on a regular basis, consider trying to start with a short time period, such as two or three days. It's really a mind-set issue! You can also work on trying to make money instead. Increasing your income will provide you with more money to add to your budget. You can pay off debt quicker, and catch up financially at a faster rate. There are so many things you could do to earn extra income. It took me about four months from when I got started, but I was able to start this blog and made $60 in my very first income report. In my first year alone, I made around $13,000 blogging while working at my full time job. That's a lot of extra income that helped me get out of debt! If you are interested in learning more about blogging, I suggest downloading these free workbooks first. They are all workbooks and guides I used in my first year blogging! If you are on Facebook and want to start a side hustle, these guys can help you get started. Most Facebook Ad specialists make a minimum of $1,000 per client per month, and only work a handful of hours in their spare time! This is one of the best ways to make money that won't cost you anything to get started! I have made thousands of dollars over the past few years taking surveys online and participating in research studies. Not all surveys are created equal. I have weeded through a ton of companies to figure out which ones pay the best. Here's a few to choose from! If you have a room or even a home to spare, turning your space into an AirBnB can have amazing results. I have friends that have switched from renting out a room in their house to using it as an AirBnB and are making so much more money! With a renter, you get a fixed monthly rate and usually enter into a month-to-month contract or one year lease. As an AirBnB host, you can often times make more income in one week via AirBnB than an entire month of rental income. To learn more about becoming an AirBnB host, click here! I have made more than $4,500 in one year in my spare time thanks to side hustling. If you have something you would like to share with your readers that can help them – whether it's mentally, financially or physically – go for it. Here is the best list of surveys to earn cash and make money. How to make extra cash during the holidays. Side hustling is great because it allows you to earn extra money by doing flexible tasks and monetizing your skills. I am so excited to see if you decide to incorporate a no spend period into your lifestyle. Ultimately, there is a good balance to be had by having a no spend period as well as trying to side hustle and earn extra income. Have you ever tried a no spend day or week? I am currently saving to study abroad second semester and realized I don’t have enough “no spend days”. These tips were extremely helpful – Thanks! Ha, I need to have more ‘no spend day’s more frequently! This was really helpful. I am always looking for ways to budget & save. I had no idea that the Redcard was linked to your bank account, I buy all my diapers and wipes from target so I will definitely be looking into that. Thanks for the info!! Honestly I have to divided my own ‘spend’ lists at journal into two separated coloumn. First contain lists all what I want and what I need, and after finished, I move a few of ‘something’ urgent in the other side. So, it could help me a lot, to define what’s truely really important and not important, urgent and not really urgent things. Yes, I’m doing a no-spend summer right now to help save money for a down payment on a home. We’re about halfway to our goal. This post is great, and I love the advice to EARN instead of spend. Shopping takes a lot of energy, and simply staying home and out of shops can free up time for money-making pursuits. Thanks for this article. Gosh I’ve really lost touch with what I WANT vs what I NEED! There are many tips shared that I have used in my past life to help me get by…I need to revisit these. Thank you to all who shared. I’ve lived on a cash only basis for about 25 years. I used to say, “The only thing I got from my last relationship was bad credit.” That started it. Since I’m low income on top of that, credit wasn’t going to be easy to get. Rather than be upset about it, I just started living on cash only. Wow! It works. No, I don’t own a house, I don’t have an expensive car, I don’t have huge medical expenses, but I do have the cutest rental house you’ve ever seen, with all but a few pieces of furniture custom-made. I live in a tiny town so I don’t even own a car. I walk everywhere or take a bus. I have a market cart (we used to call them granny carts–not sure if they still do or not) so I can get bigger stuff and still walk home. Here’s the most important thing I learned. It came from Barbara Sher in her book Wishcraft. The bottom line is that people have what you want and many times they have it lying about and would love to give it to you but don’t know you need it. Just put it out there that you’re looking for ___ and you never know what might turn up. I once moved into an apartment that had everything in the kitchen but a stove. The rent was so cheap I took it. I started telling folks at work I was looking for a stove. Before I had a chance to go to a thrift store one of my co-workers said they had one they had never gotten around to getting rid of. It turned out to be an extra-wide one with a large oven and a big storage space for pots and pans. It worked great and was totally free. He and three of his strongest friends even delivered it. When we learn to live on what we have, life is so much sweeter. I never have to worry about how I’m going to get the money to pay the minimum on my credit card bill. Oh, I also do little side stuff as well. I pet sit and crochet afghans for sale. Life’s good. Cynthia, you are so smart and crushing it! It is so great not to have to worry about the Joneses and focus on what you have and loving it. Thanks for sharing! Great tips thank you for sharing. I will be taking my one week challenge next week. I am really looking forward to it.